I know it sounds funny. Whenever I tell people the idea of putting pepper in desserts I get that confused tilt of the head, and a puzzled expression comes over their face, like when you hide a dogs ball from him behind your back and say "Where's the ball?" ...then I say again, "Yeah, I use pepper in my desserts." And because they know my reputation as a Dessert Diva, Pastry Guru, (shall I go on?) they consider it, for a pensive moment, saying something mildly supportive like, "Hmmmmmm, I never thought of that." But for me it seems perfectly natural, the way some people think it's normal to put salt on watermelon. It makes sense to my over educated pallet, and I find when people actually TRY it, they actually GET it. It's not that foreign and idea...we have peppery wines like gewurztraminer. Early batches of hot chocolate the Mayans drink by the gallon were often seasoned with chilies and it drove Cortez to want to conquer Montezuma and his people for it...well that a few other things, like vanilla beans, and of course all that gold. But maybe it started with my mom's fried matzah for breakfast, seasoned only with salt and lots of black pepper and then doused in maple syrup. Some families use jam to top it off too, but the results are the same- pepper with sweet. If you're not familiar with fried matzah, it's basically scrambled eggs but you fold in water-soaked matzah, to extend the eggs and use up left over matzah, mostly from Passover. There was the combination of pepper and sweet that would return to haunt me over and over again when I was searching for the missing flavor in a dessert I was building. And then along comes my literary chef mentor, James Haller from the Blue Strawberry restaurant in Portsmouth, New Hampshire. His book landed in my mail box through a book club in 1975 and I practically devoured it (sorry for the food pun) cover to cover. He preached combining flavors that you thought went together. Who cares about tradition, or what your mother taught you, or what the traditional cooking teachers proselytize ...it is the internal instinctual chef in you that picks what flavor goes with what flavor. If you think pineapple goes with sweet potatoes, then it does. If you think white pepper goes with blueberries, then it does. Then fast forward to my restaurant Tru, created 10 years ago this May, where our mantra is to be Tru to your art, Tru to your journey...and voila! I'm sitting trying to figure out what would compliment my Roasted Pineapple Carpaccio with Key Lime Sherbet and Cilantro Vinaigrette and what pops into my head is black pepper...I rewind, try to think of a finishing flavor again and end up in the same place...black pepper. So I grind some on it, and it works. I mean, it REALLY works. So I start to try it in custards, in ice cream bases, I think of trying white pepper, black peppers subtler sibling which is actually black pepper without the peel which takes away some of the heat. I use it in shortbread and then I try chilies in my pistachio tuiles, and green pepper corns with roasted peaches and then back to black pepper in my chocolate pot de creme and it works, it really, really works. Gale Gand is a James Beard Award winning pastry chef and executive pastry chef and co-owner of the world-renowned Chicago restaurant Tru. The host of Sweet Dreams, Food Network's first daily show devoted to baking, she is the author of six previous cookbooks, including Gale Gand's Just a Bite: 125 Luscious Little Desserts and Chocolate and Vanilla. Gale Gand's Brunch! 100 Fantastic Recipes for the Weekend's Best Meal was published in April 2009. For more information and a full biography, visit Gand's personal web site. A tender delicate texture and buttery flavor are what you expect from any shortbread; now add a mild tingle of heat dancing on your tongue between bites and you have Gale Gand's White Pepper Shortbread. It's subtle, but just enough to inspire pause with each bite. 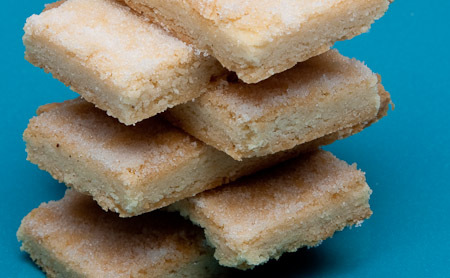 Shortbread is a perfect dessert if you are short on time or out of eggs. It's easy to put together, doesn't require room temperature butter (so you don't have to plan ahead), and everyone loves it. Though unadorned, it's lovely in a pure buttery goodness sort of way, the hint of white pepper really makes this unassuming cookie intriguing. 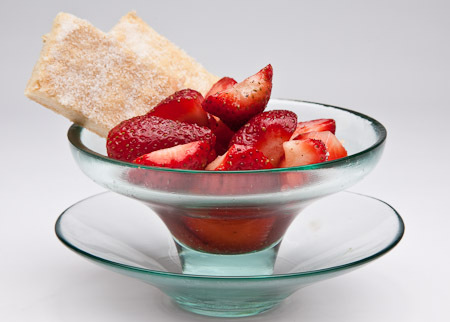 The fact that fresh ripe strawberries simply sliced in a bowl are so delicious they qualify as dessert says a lot; add a touch of sugar and a few grinds of fresh black peppercorns and it becomes a fancy dessert! This is the magic of cooking with spices; just a pinch can transform a dish into a stunning new experience. Pair these strawberries with a rich vanilla ice cream and you have a four-star dessert experience in a matter of minutes. This is proof that elegant and delicious can also be simple and pure. I first became a fan of Gale Gand through her Food Network show Sweet Dreams. I had the pleasure of meeting her at the International Housewares Show where she did a cooking demo and served the audience some amazingly delicious ricotta doughnuts. She really is as friendly, funny and filled with stories as her books and TV show indicate. Gale's interest in contributing an article on using pepper in desserts for our Spice Inspiration project made perfect sense to me. After all, in her first book, Butter Sugar Flour Eggs: Whimsical Irresistible Desserts , there is a chapter focusing on spice with recipes like Nutmeg Cheesecake, Saffron-Pistachio Ice Cream, and Five-Spice Tea Cake. She writes in that chapter that "Spices are the jewelry of dessert-making - the alluring, decorative touches that give style to simplicity and add sensuality to seasoning. Choose them carefully, use them wisely, and you'll dazzle everyone." The White Pepper Shortbread and Strawberries in Syrup recipes she shares with us will dazzle everyone, so give them a try and see for yourself. I have cooked from all of Gale's books over the years and enjoyed her creative twists on dishes. In Gale Gand's Just a Bite: 125 Luscious Little Desserts, for example, she has Sour Cream Seed Cakes with Earl Grey Glaze. These little cakes feature poppy seeds and fennel seeds and are perfumed by earl grey tea. For all of her experience as a professional pastry chef and partner in a fine dining restaurant, the recipes in her books draw more from her family and the influential home cooks in her life. Every book is filled with personal stories that bring the recipes to life through a multitude of entertaining characters and anecdotes. She fully embraces the real-life time constraints most of us face in Gale Gand's Short and Sweet: Quick Desserts with Eight Ingredients or Less, by breaking the chapters up based on the amount of time needed to make them ranging from 15-minute recipes to 45-minute recipes. In Chocolate and Vanilla, Gale focuses on these two cornerstones of the pastry world with great in-depth background information and a collection of fun, and many very easy to make, recipes. Gale struts her find-dining pastry skills in Tru: A Cookbook from the Legendary Chicago Restaurant with elegant plated desserts that are works of art. Gale Gand's Brunch! 100 Fantastic Recipes for the Weekend's Best Meal, released in April 2009 has sparked a new love for cooking breakfast in me. Our Easter brunch came right out of this book and was delicious! I think the beautiful photos are partially to blame for why I have nearly every paged flagged, but also the collection is broad spanning practical dishes for any day, some simple yet elegant for entertaining, and a sprinkling of unique recipes for a little adventure; like Watermelon Gazpacho with cucumber, red pepper, apple and pomegranate seeds and Goat Cheese Cake with Slow-Cooked Quince. 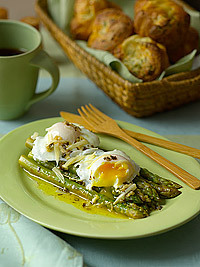 Gale was kind enough to share a little taste of what's in her new book by giving us the recipe for Asparagus with Poached Eggs and Parmesan.